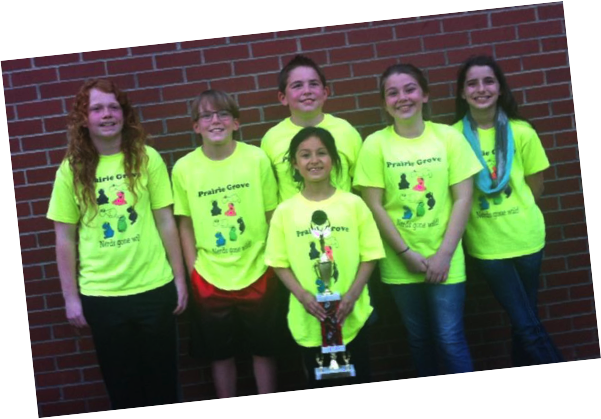 For the second year in a row, our Odyssey of the Mind team won 1st place at the regional level and this past weekend, the Prairie Grove Odyssey of the Mind team competed against teams from all across Arkansas and won 2nd place in the state for their problem and division! Our team will now be one of 31 teams to represent Arkansas at the World Finals, where there will be more than 800 teams from all across the US and up to 25 foreign countries! This is an incredible opportunity for these students to be able to take their problem-solving skills to the next level, meet and interact with foreign teams, and get to experience a little of their cultures, all while continuing to develop crucial skills such as: teamwork, creative thinking, time management, leadership, problem solving and more! Odyssey of the Mind was started in 1978 with the goal of teaching students to learn creative problem solving methods while having fun in the process. Odyssey of the Mind teaches children how to think divergently by providing open-ended problems that appeal to a wide range of interests. Students learn how to identify challenges and to think creatively to solve those problems. Every year, five new competitive problems are presented for teams to solve. These long-term problems are solved over weeks and months. Some of these problems are more technical in nature, while others are artistic or performance-based. Each long-term problem rewards creativity – AKA style - in the solution. This helps teach students that they should not simply try to solve problems, but to take the next step of enhancing their solutions. At the competitions, the teams are also given an on-the-spot, spontaneous problem to solve. The combination of long-term problem solving, style, and spontaneous problem solving produces confident and able students ready to tackle the problems facing this world, as they are the next generation of leaders! We will only receive part of the funding we need to make the trip to the World Finals from the school district. To help offset to costs associated with getting our team to the World Finals Competition, we are seeking sponsorships from local businesses and members of our community. Your sponsorship will not only make it possible for our team to make the trip to compete at the highest possible level, but it is also an investment into the lives of these students. Your sponsorship will allow them to gain invaluable experience as they continue to develop crucial skills while addressing real-life problems and as they prepare to be the future leaders of our community and our state. Thank you in advance for your generosity and support of our team!